Founded in 2007, PlasmaDesign’s nucleus is a small, dedicated team of designers and craftsmen. Together we produce the world's most innovative business cards. We start by offering every customer a free design service. We don't believe in templates. Instead we believe that the development of the artwork should be a collaborative, creative process that’s given the time and attention it deserves. Once designed, our craftsmen use traditional artisanal manufacturing techniques, helping to preserve crafts that would otherwise fall by the wayside in our increasingly automated and impersonal world. It’s this dedication to truly bespoke design and traditional production methods that cultivate a level of ownership, pride and excellence that shines through in our products. Whether it's using chemically milled stainless steel, laser cut wood, translucent plastic, or traditional letterpress, PlasmaDesign is world renowned for producing business cards that are different. We combine cutting edge design with traditional manufacturing techniques, helping to preserve crafts that would otherwise fall by the wayside in our increasingly automated and impersonal world. We provide a completely free design service. Our designers give your business card design the time and attention it deserves, ensuring that the finished article is as unique as you and your organisation. Designed and crafted in the UK. Shipped worldwide. Our metal business cards make a statement. Manufactured from rolled stainless steel using state of the art photo-etching, automated milling and electrophoretic processes, they marry form and function perfectly. We intricately cut through the metal and etch into the surface of the steel. Our 3mm thick wooden business cards are available in Finnish birch, bamboo, American cherry and black walnut, all chosen for their distinct coloration and characteristics. Every card is laser cut from a larger sheet, giving each one its own unique grain. The strata construction eliminates any weakness and enables intricate cut patterns without fear of fragility. Our plastic business cards are truly unique. The plastic is the same thickness as a standard credit card. Every single one is printed by hand, bringing modern materials and traditional manufacturing techniques together in an innovative business card that ensures you stand out from the crowd. Our letterpress business cards are printed by hand using traditional artisanal techniques. There’s no automation and no compromise. Each ink is gently embedded into the subtly textured surface. A seam of colour runs through the centre of the triple ply card, adding a unique finishing touch. Our standard business cards are manufactured using thick 400gsm ultra white stock and printed in full colour on both sides. Colours are vibrant; text is crisp. Matt lamination protects the surface. We also offer the options of UV spot gloss and metallic foiling. Founded in 2007, our nucleus is a small, dedicated team of designers and craftsmen. We are renowned for our metal, plastic, wood and letterpress business cards and for providing a free, bespoke design service. We combine cutting edge design and workflows with traditional printing techniques, helping to preserve crafts that would otherwise fall by the wayside in our increasingly automated and impersonal world. And while it’s true that we ship to 129 countries, we firmly believe in supporting our community by employing locally and manufacturing all of our products here in the United Kingdom. At our core we're designers. 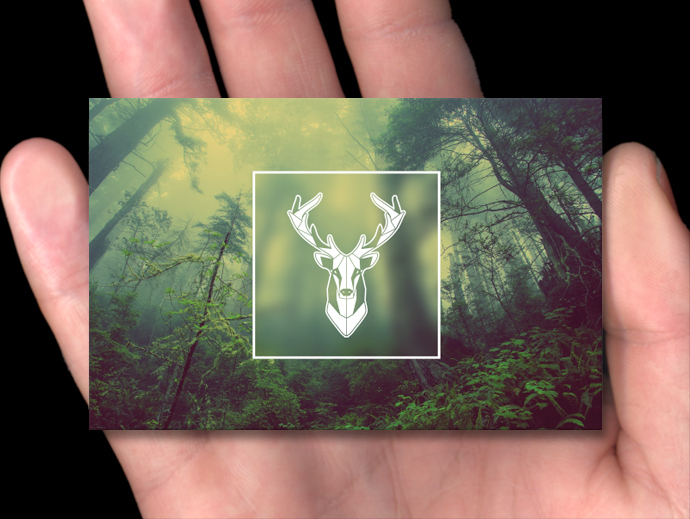 Our company is built around the belief that an effective business card has to be as unique as the person handing it out. Our dedicated graphics team has years of experience, designing bespoke, original business card designs using innovative materials. Sometimes the old ways truly are the best ways. The handcrafted nature of our production process enables us to reproduce artwork that wouldn't otherwise be possible. This dedication to traditional techniques cultivates a level of ownership and pride that’s simply not possible when production is heavily automated. The single most important thing to us is the happiness of our customers. We believe that by producing truly great products and delivering the sort of stellar customer service only a small company can provide, the more mundane side of the business will take care of itself. Our customers agree. To date our plastic, metal & letterpress business cards have winged their way to customers in 131 different countries. We produced almost 1.7 million bespoke business cards last year, each one helping our clients to put their best foot forward and make a great impression. In the past 12 months, we have applied 265km of foil to our innovative translucent and satin plastic business cards. Our designers have collaborated with 6,129 companies and individuals over the last 12 months. "10/10 service with a thorough, consultative process and stunning print finish. Definitely using you guys again." "Absolutely wonderful thanks - worth every penny. I now have a stunning business card!" "OMG OMG and more OMG! I love the cards! They are of the hook. Thank you so much for doing this for me. I will spread the word and tell them about your company." "I just wanted to contact you and thank you for your impeccable service. My design was spot on from the first proof from your designers. The price was fantastic for the quality of the cards that I have received. They portray my business in a way that I intended 5 years ago but never quite got there. I can't thank you enough! I shall have no problem in highly recommending you in the future!" Below is a selection of cards, each the result of the free design service offered to every customer. We provide an entirely free design service to customers who don't already have print-ready artwork. Once we have collected a few pieces of information, our design team puts together an initial concept. We then generate a photo-realistic digital mockup using our innovative proofing system. This shows how the card would look once produced. Then, using your feedback, we make revisions until you are 100% happy with the layout. No two people or businesses are alike. We've created artwork for tens of thousands of customers and never come across two organisations whose requirements are identical. We don’t believe in templates. Instead, we firmly believe that the development of the artwork should be a collaborative, creative process that is given the time and attention it deserves. It’s the only way to make sure that the business card is as unique as the person handing it out. Customers need an understanding of how the final product will look and feel before placing an order. Yet the cost of tooling makes it impractical to manufacture single specimens. We’ve solved this dilemma using a digital proofing system. We provide images showing how the card will look once produced. Coupled with our ability to provide free samples of previously manufactured cards, the customer can accurately assess the design and quality of their card before placing their order. We are not naïve enough to think that the first design we send you will be a winner. There will be elements you like and some you don’t. Every customer has different tastes and priorities. So we don’t place an arbitrary limit on the number of revisions we’re prepared to undertake. Instead, we work with you, using your feedback to patiently revise and alter the artwork, moving the project forward until you are 100% happy with the way it looks.